While stumbling through cute camera charms for my previous post I found a necklace to express true devotion to the craft of photography. 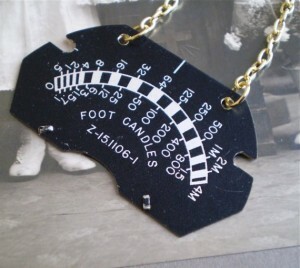 Yes it is a vintage light meter plate hang around a neck quite elegantly on a gold chain. A conversation piece if ever there was one and a declaration of your love of light. Married to the photographer... what more can I say? Dear Photographer, Tip, Love Your Client.